Marie Larochel in her apartment at 538 East 21st Street in Brooklyn, which she shares with her pregnant daughter. 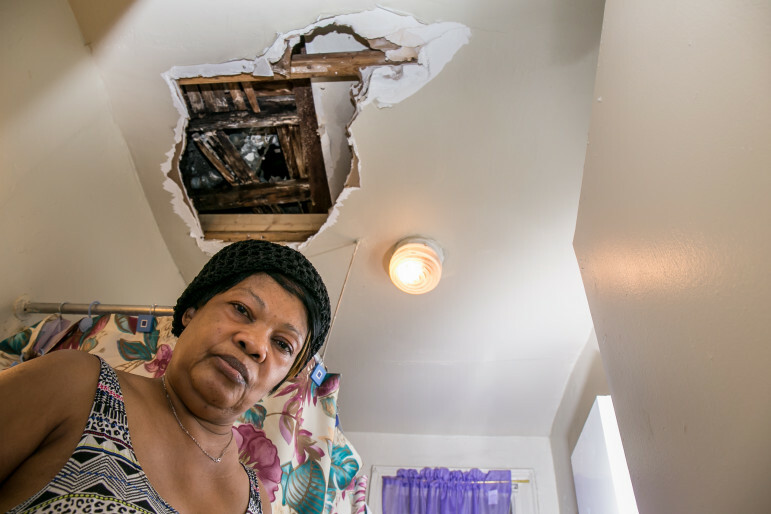 About a month ago, a water leak caused a hole in her bathroom ceiling. In a city where more than 60 percent of residents are renters and rents are perpetually too damn high, New Yorkers are preconditioned to view their landlords as mustache-twirling cartoon villains. Even the most cynical of apartment dwellers, though, would do a double take when spotting the name of the latest property owner to start gobbling up properties in central Brooklyn: Shamco Management. The name, it turns out, has innocuous enough origins: The company was founded in 1980 by Brooklyn native Joseph Shamah, with the purchase of a building on East 29th Street in East Flatbush. (Shamco is technically only the building manager; the ownership arm is Shamah Properties, though the two share an address and other legal paperwork.) Since Shamah’s death in 2011, his son Alan Shamah and grandson Edward Setton, along with fellow investor Carl Zekaria, have expanded the business to encompass dozens of properties through the five boroughs. According to tenant leaders in Flatbush and Ditmas Park, however, Shamco has done its best to live down to its dubious name. They charge that their landlord has deliberately bought up rent-regulated buildings in a rapidly gentrifying area, then used dubious fees and other tactics to jack up rents in an attempt to force out existing tenants and bring in more lucrative ones. New York City’s rent regulations, which currently cover about one million city apartments, are meant to prevent such unexpected hikes by limiting the amount that rents can rise each year for existing tenants. But landlords have long since learned how to exploit loopholes to evade these restrictions. One favorite Shamco trick, according to residents and tenant organizers, is to seek to recoup the cost of major upgrades to their buildings via rent hikes above and beyond what rent regulations would normally allow. Housing law allows landlords to apply to the state Department of Housing and Community Renewal for rent increases linked to either improvements to individual apartments (dubbed Individual Apartment Improvements) or capital work that affects entire buildings (called Major Capital Improvements) by simply submitting receipts for work performed. This has long been a system ripe for abuse, and Shamco tenants say their landlord is a prime perpetrator. In Williams’ building in 2013, for example, Shamco filed a claim for $74,000 it said it incurred for repointing the building facade and repairing the heating system. When Williams and other tenants discovered the resulting hike in their rent bills, they filed appeals with DHCR, pointing out that they still had insufficient heat and walls that leaked when it rained. DHCR eventually rejected the MCI increase, noting that the building had just been repointed eight years earlier, and the heating improvements didn’t include a new boiler as required for a rent increase. Mystery fees such as these are commonplace, according to Shamco tenants, who say they’ve been hit with an array of charges, often without explanation, for everything from owning a washing machine to being late with rent payments, even when they paid on time. Such fees have long been allowed by state law, but have reportedly escalated in recent years. A report released in April by Stabilizing NYC, a citywide coalition of neighborhood housing groups including Flatbush Tenant Coalition, surveyed 526 tenants in 208 rent-regulated buildings from low-income neighborhoods around the city; though the sample was self-selected, the numbers are still eye-popping: Average fees amounted to $518 a month, or almost half the tenants’ average rent. “These fees have been around a long time,” says Harvey Epstein of the Urban Justice Center, which helped prepare the Stabilizing NYC report. But the charges are becoming more and more popular, he says, especially with larger private equity landlords. These real estate companies — Trojniak prefers the term “predatory equity” — borrow heavily to accumulate a portfolio of buildings, which creates pressure to increase rents, and fast, by any means possible. Shamco certainly fits the profile in terms of speedy acquisitions. Over the past five years, according to records compiled via PropertyShark.com, a series of limited liability companies associated with Shamco’s principals or its 919 Coney Island Avenue address have bought up 16 Brooklyn apartment buildings, all located in rapidly gentrifying areas of Crown Heights, Lefferts Gardens, and the borderlands spanning eastern Ditmas Park and western Flatbush (see map). In one set of transactions in April 2012, Shamco-related LLCs spent more than $42 million to pick up a collection of six buildings from Skyline NYC, a subsidiary of another major city landholder, Urban American Management. The bigger problem, says Trojniak, is that there’s little incentive for landlords to obey the law when they can make more by violating it. “The way that DHCR operates, the burden is always on the tenant to make a complaint,” explains Trojniak. “So a landlord could do whatever they want — they register, they don’t register, they make up rents, they don’t make up rents — none of it makes a difference until somebody complains.” And since the only penalty is typically for DHCR to order rents reduced to where they were before the illegal increase, there’s little downside to hiking rents and hoping that tenants don’t object. While DHCR did not agree to a City Limits interview request, both Trojniak and Epstein say the problem comes down to money. In particular, the state-run Tenant Protection Unit, set up by Gov. Andrew Cuomo in 2011 after growing complaints that landlords were harassing tenants to gain vacancy increases, is empowered conduct broader investigations of landlords with multiple complaints. But even after the TPU escaped State Senate attempts at defunding it this spring, the 25-person unit remains grossly understaffed to oversee a million units of housing — and even when they are able to reverse rent hikes, says Trojniak, landlords will often raise rents right back without consequence. Following the release of Stabilizing NYC’s report, DHCR did issue a new factsheet on fees in May, spelling out some tenants’ rights: attorney fees can only be collected by court order, late fees are limited to 5 percent of the monthly rent, and tactics like painting and cleaning fees are illegal — all of which, says Epstein, “was really helpful.” But it’s still up to tenants to pursue challenges themselves. With that in mind, Williams advises all tenants to start by filing a request with DHCR for their rent history — even if they’re not sure their building is rent-regulated — and then aggressively pursue rollbacks on anything that seems dodgy. City Limits’ coverage of housing is supported by the Charles H. Revson Foundation. The move comes at a critical time for the country’s largest and oldest public housing authority. The administration’s proposal also affects industrial space, parks, schools and transit. The city and critics often disagree on where there’ll be problems, and if so, how to solve them. Celebrity real-estate broker Ryan Serhant is promoting two luxury towers that will rise on sites now occupied by garages on East 13th Street. Next door, in a property sold in a package with those sites, tenants are suing over a pattern or harassment.